For those of you in the US, this means copies will be for sale at the various summer conventions where ZNB are in the Dealers Room (or equivalent), so do check in with them on social media, to find out where they’ll be. Kickstarter supporters will receive their copies in customary fashion, and everyone else can pre-order the ebooks online, and the trade paperback via ZNB’s online store. The Green Man’s Heir – a modern fantasy rooted in the ancient myths and folklore of the British Isles. Alongside this fabulous artwork by Ben Baldwin, I thought I’d share some of the inspiration underpinning this new novel from Wizard’s Tower Press. I grew up with the folklore of the British Isles, by which I mean English, Welsh, Cornish, Irish and Scottish legends, from the Lowlands to the Highlands and Islands. These were stories of giants and witches and dragons and trolls and goblins and boggarts and serpents and will o’the wisps, to name but a few. There were all sorts of fascinating books in the library alongside The Hobbit and the Chronicles of Narnia. Publishers like Pan and Picador offered paperback collections of folktales, retelling the legends of Jack the Giant Killer, Jenny Greenteeth, the Lambton Wyrm and many, many more besides. I saved up my pocket money and bought some of them; second-hand, dog-eared paperbacks that have somehow vanished over the years through umpteen house moves. That doesn’t matter. The stories have stayed with me and with the benefit of hindsight, I now realise those tales have had a lasting effect on my own writing. Most of them weren’t about heroes and princesses. They were about ordinary boys and girls finding themselves in extraordinary situations, and in very real danger. Getting out of potentially lethal trouble meant using your wits and courage to outfox and defy these mysterious supernatural beings. I still buy books on folklore, from scholarly examinations of the social and psychological underpinnings of stories of witches and fairies, to collections of local legends found in English Heritage, CADW, Heritage Ireland, and National Trust bookshops. I am still fascinated by that intersection between the everyday and the eerie that was part of everyone’s life for centuries. So I suppose it was inevitable that when I found myself with an idea for an urban fantasy novel, it wasn’t going to be about vampires and werewolves. Those weren’t the creatures that lurked in the shadows outside the window when I was growing up. Similarly, the story wasn’t going to be any sort of urban fantasy, but a tale set in the countryside because that was where these legends took place, amid the forests, caves, rivers, stone circles and barrows that still link these islands to its mysterious past. The mass market edition of The Death of All Things is now available, and as those who backed last year’s Kickstarter can attest, having already had their copies, it’s an anthology full of excellent stories. The authors are – K. M. Laney, Andrea Mullen, Faith Hunter, Kendra Leigh Speedling, Jason M. Hough, Julie Pitzel, Shaun Avery, Christie Golden, Leah Cutter, Aliette de Bodard, Andrew Dunlop, Juliet E. McKenna, A. Merc Rustad, Ville Meriläinen, Amanda Kespohl, Mack Moyer, Fran Wilde, Kathryn McBride, Andrija Popovic, Jim C. Hines, Stephen Blackmoore, and Kiya Nicoll. Are some of those names unfamiliar? They surely will be, because one of the many good things about these anthologies from ZNB is the editorial team’s dedication to including new voices by offering slots to unpublished writers, via an open call for submissions once the Kickstarter funding is secured. If you’re an aspiring writer, do keep your eyes open for the submission guidelines for this year’s new projects, and take note that ZNB is now a qualifying market for SFWA membership requirements. Meantime, Joshua Palmatier has written this in-depth post for File 770 on what he looks for through the selection process. This dedication to new voices is just one reason why I and other writers keep coming back to be part of ZNB projects. Others include (but are not limited to) their high standards in editorial feedback and book production, and being paid a professional rate. ZNB may be a small press but they’re thoroughly professional when it comes to creating books worth having for the reader, and worth doing for the writer, whether you’re not yet published, just starting out, or an established author. While you’re browsing, take a look at the other ZNB anthologies out this month. All Hail Our Robot Conquerors harks back to SF of the 1950s and 60s and the era of evil robot overlords, invading cyber armies, and not-quite-trustworthy mechanical companions. Submerged turns its back on deep space to stare into deep water. Do dark monsters swim unseen beneath the waves? What ancient wonders lie hidden, waiting to be discovered? What sirens call …? I mentioned this year’s new projects earlier. Here’s the Kickstarter page with all the information you’ll be looking for. I’m signed up for SECOND ROUND: A RETURN TO THE UR-BAR, alongside Jacey Bedford, C.E. Murphy, Kari Sperring, Kristine Smith and Gini Koch. This is going to be great fun, since the 2011 publication by DAW Books of AFTER HOURS: TALES FROM THE UR-BAR, was the very first anthology edited by Patricia Bray & Joshua Palmatier. That’s what started them down the road which eventually led to the formation of the small press Zombies Need Brains. So I’m looking forward to returning to that legendary time-travelling bar with all-new stories set throughout the ages. Let me repeat that – “all new” means none of us are returning to the era we visited before, as the immortal bartender Gilgamesh serves up drinks mixed with magic and a dash of intrigue. This also gives me the opportunity to offer up a Tuckerisation as a reward at the $250 pledge level. Fancy seeing your name – or someone else’s – in print as a character in my story? I’m also offering a signed set of the Chronicles of the Lescari Revolution trilogy as one of the $90 pledges. There are a whole lot of other incentives and add-ons, so do check them out! Today sees the publication of an anthology which I’m very pleased to be part of: Journeys (from Woodbridge Press) offers fourteen epic fantasy stories of daring, death and glory from an array of talented and interesting authors. To be precise, there are tales from John Gwynne, Adrian Tchaikovsky, Gail Z. Martin, me, Julia Knight, Juliana Spink Mills, Jacob Cooper, Samanda R Primeau, Steven Poore, Davis Ashura, Dan Jones, Charlie Pulsipher, Anna Dickinson, and Thaddeus White. My own story? Well, I may not be writing novels set in Einarinn at the moment but that world is still very much in my thoughts, both in terms of what’s going on with all the characters we know and also, I find I reflect now and then, on key moments in that world’s history. The Road to Hadrumal picks up on some hints dropped throughout those books, from The Thief’s Gamble all the way to The Hadrumal Crisis trilogy, about the origins of wizardry’s organisation. I thought I’d look a little more closely at Trydek, the very first Archmage. Who was he, before he became the revered father of magic? Before he made his way to Hadrumal? What prompted him to make that particular journey? What sent elemental magic down the path that’s lead to its power and influence in Einarinn’s present day? Well, you can read the story to find out. What I want to talk about here is how writing this particular story enabled me to show a group of aspiring SF&Fantasy writers the journey that a piece of fiction takes, whether you’re just starting out, or whether you’re someone like me with fifteen novels and umpteen short stories to your credit. More than that, I’m convinced that every story must take this journey if it’s going to be worth reading. Last December I was teaching on a residential course at Moniack Mhor, the Scottish Creative Writing Centre, up near Inverness. As part of my preparation, I had submissions from the students to critique. This means I arrived a folder of pages extensively marked up with red pen… Now, getting your work back covered in queries, suggestions and corrections is not necessarily an easy thing to handle. Writing’s such an intensely personal thing and we invest so much time and effort in it, that seeing it criticized can really sting. I know that full well myself. So what could I offer these keen writers, to ease that impact? I realised I could show them the editorial notes that I had been sent for this particular story. As it happened, that was a page’s worth. Now, Teresa Edgerton knows what she’s doing. She started off by telling me what she particularly liked in the story, highlighting original angles that had caught her eye and complimenting me on my clean prose. That was about three or four lines worth. And then… she highlighted the things which I needed to address in that final draft story. Points where the pace needed looking at. Points where character motivations and their reactions needed further consideration. Points where what I had written might challenge reader engagement. She offered a few thoughts on possible routes to pursue, though of course, as all good editors agree, deciding what to do was up to me. It’s my story after all. But every story needs fresh eyes. In this particular instance, Teresa’s viewpoint was invaluable and all the more so because she’s not an established reader of my Einarinn books. Her comments made me realise that I had been subconsciously writing for people with a far greater knowledge of my existing work than was either fair or desirable in a story like this. Among other things, I was presuming background knowledge that would generate tension that wasn’t there on the page. I was including additional details to tweak tantalizing loose threads from the novels which played no direct part in these events. Then I told myself that was more than enough self-indulgence and got to work. Because on my personal journey as a writer over nearly twenty years now, I’ve learned that this is how writing good fiction works. So I sat and thought and then I tightened things up here and there. I cut and trimmed elsewhere, and clarified this and that. It wasn’t a great deal of work but now that I had seen this story through Teresa’s eyes, I had a whole new, sharper focus. So that’s the story of this particular tale’s journey. Enjoy! Oh, and those aspiring writers at Moniack Mhor? They worked with me so positively on my feedback that I have great hopes of their future success. Those who’ve enjoyed the short stories free to read on this website will find a familiar name in the tale ‘A Warning Shiver’, which is now to be found in the new ‘Shadow Histories’ collection. They will discover that the Icicle Witch is now firmly entrenched in River Kingdom folklore, years after the first references to her, in ‘Patience, a Womanly Virtue’ which you can read here. Is this all part of some cunning writerly plan, eight years in the making? That story was first published in the British Fantasy Society Yearbook 2009 after all. Sorry, no. ‘Patience’ is simply another short story where I was exploring elements that I first started putting together in the new collection’s first two stories, ‘Walking Shadows’ and ‘Noble Deceit’. The Sun Goddess and the Moon God both feature, along with the religious orders that honour them, as well as noble barons owing fealty to a king. Though it’s interesting to look at this tale alongside the other Shadow Histories stories. It’s now apparent, with the benefit of hindsight, that this is a tale from the days of long ago, before the River Kingdom was established. It’s a story of a fragile and disputed royal succession, and of the merciless lengths some people will go to, in order to secure their own power. As well as the enduring power of enmity and the way such hatreds take on a life of their own. Where did the idea of the Icicle Witch come from? I’m honestly not sure, other than recalling my thoughts turning to cold and ice, when I was looking for a concept of malice to set against the twin and cooperative, complementary deities embodied in the Sun and the Moon. I’d say it’s fairly obvious my subconscious went riffling through memories from my childhood reading, to draw on Narnia’s White Witch and Hans Christian Andersen’s Snow Queen, among other precursors. I decided not to include this story in the new collection. For one thing, it’s been free to read here for a good while now. More than that, all the other stories take place in the same general time frame, generations later, when the River Kingdom is secure and prosperous. The collection’s tales also all have a magical element that’s notably absent here. But still… if the myth of the Icicle Witch was already becoming common currency in rumour so many years before, how would such folklore become manifest in the era of the Shadow Histories? As soon as I wondered that, I realised I had the basis for a new and original story. That was something I wanted to write for this book, so that even my keenest readers will find something they’ve never seen before. To learn more about the River Kingdom, its places, its peoples and its magic, click here. Shadow Histories of the River Kingdom – here’s how to get a copy! US readers can get the Nook edition here. Thankfully, that’s not the only game in town. You should also be able to order the paperback through your local bookshop in the UK and in the US – it’s listed in their wholesale catalogues. I’ll update with more links as the vagaries of availability smooth themselves out! For those looking for an introduction to this world, its people, its places and its magic, click here. As regular readers will know, I thoroughly enjoy contributing to the themed anthologies edited by Patricia Bray and Joshua Palmatier. So far I’ve had stories in ‘After Hours‘, ‘The Modern Fae’s Guide to Surviving Humanity‘ and ‘Temporally Out of Order‘. And I don’t just enjoy writing for these books. One of the great pleasures of anthologies is seeing what other writers have done with the same theme. Next up, I have a story titled ‘The Sphere’ in ‘Alien Artifacts’. Kickstarter backers have already had the fun of reading this collection and now the ebook edition can be pre-ordered. The mass-market paperback will follow shortly. What might we run into as we expand beyond Earth and into the stars? As we explore our own solar system and beyond, it seems inevitable that we’ll run into aliens … and what they’ve left behind. Alien artifacts: what might they reveal about us as we try to unlock their secrets? What might they reveal about the universe? In this anthology, nineteen of today’s leading science fiction and fantasy authors explore how discovering long lost relics of alien civilizations might change humanity. Join Walter H. Hunt, Julie Novakova, David Farland, Angela Penrose, S.C. Butler, Gail Z. Martin & Larry N. Martin, Juliet E. McKenna, Sharon Lee & Steve Miller, Andrija Popovic, Jacey Bedford, Sofie Bird, James Van Pelt, Gini Koch, Anthony Lowe, Jennifer Dunne, Coral Moore, Daniel J. Davis, C.S. Friedman, and Seanan McGuire as they discover the stars and the secrets they may hold—both dark and deadly and awe-inspiring. What’s my story about? Well, when an alien scout crashlands on Earth, it brings a whole shipload of things for scientists to try to fathom. Will they solve these vital puzzles before that scout’s fellow space-farers turn up to find out what happened? For those of you who prefer to use Kobo, you can find the ebook here and a quick search will find you all the other anthologies. And whatever your preference for reading and purchasing, don’t forget to check out the other anthologies from ZNB – ‘Clockwork Universe: Steampunk vs. Aliens‘ and ‘Were-‘ for still more excellent reading. Writing an extended sequence of novels like the Tales of Einarinn and my subsequent series set in that world doesn’t stop a writer like me from having other ideas. In many cases, that idea will be a one-shot wonder just right for a short story. Sometimes though, that short story turns out to be the first step on a longer journey. Back in 2008 I was invited to contribute to an anthology entitled ‘Imaginary Friends’. I began thinking about the ways in which such a friend could be both real and imaginary – to one person at least. If everyone knew what was happening, there wouldn’t be much of a story. But if only one person could see this mysterious friend, what then? Comedy? We’ve all seen that episode in every telly SF/fantasy series and in films from ‘Harvey’ onwards. What if this is something darker and more mysterious? Monsters from the Id? That’s one classic Science Fiction answer – but what if there are no such easy explanations? What if there’s uncanny magic at work, something imperfectly understood? Because magic doesn’t always have to be codified and organised by learned, collegiate wizards like those in Hadrumal. What if such magical creatures come from a parallel realm of superstition and myth? Let’s imagine a world with different layers of existence like those glimpsed in a picture that’s been hanging on my wall ever since my sister gave the family our pick of the pieces she did for her Art A Level? But no matter how dangerous it might be, some people will always make use of magic, or at least, they will make the attempt. Meantime, surely some of those with such perilous power will feel a responsibility to protect those who remain unawares? Who will watch over the vulnerable? Who will watch the watchmen? What could I do with such universal SF and fantasy questions in this particular setting? I’ve been exploring these and other ideas in various stories and one novella set within the River Kingdom ever since. The more I’ve written about it, the underlying concept and this new fantasy realm without the fixed and comforting borders of coasts and seas has steadily expanded. Now I’m seeing possibilities for further and longer stories set in this world, exploring the relationships and conflicts between its tangible and intangible aspects. So the time is right to offer this collection – with the addition of one entirely new story. Those who’ve come across one or two of these tales thus far can now enjoy them all. Those who’ve only read my Einarinn books can enter a whole new fantasy world. As always, I am indebted to the talented people I’m working with, providing key skills that I lack. Ben Baldwin, who you’ll recall did the fabulous Aldabreshin Compass artwork you can admire to the left of this post, has produced another stunning cover. Sophie E Tallis is working on a truly awesome map. Cheryl Morgan of Wizard’s Tower Press has been getting to grips with all the intricacies of making the book available in paperback as well as electronic formats. You can find details of this world, its people, places and magic here, along with Sophie’s fabulous map and a link to purchase info via Wizard’s Tower Press. Western Shore. 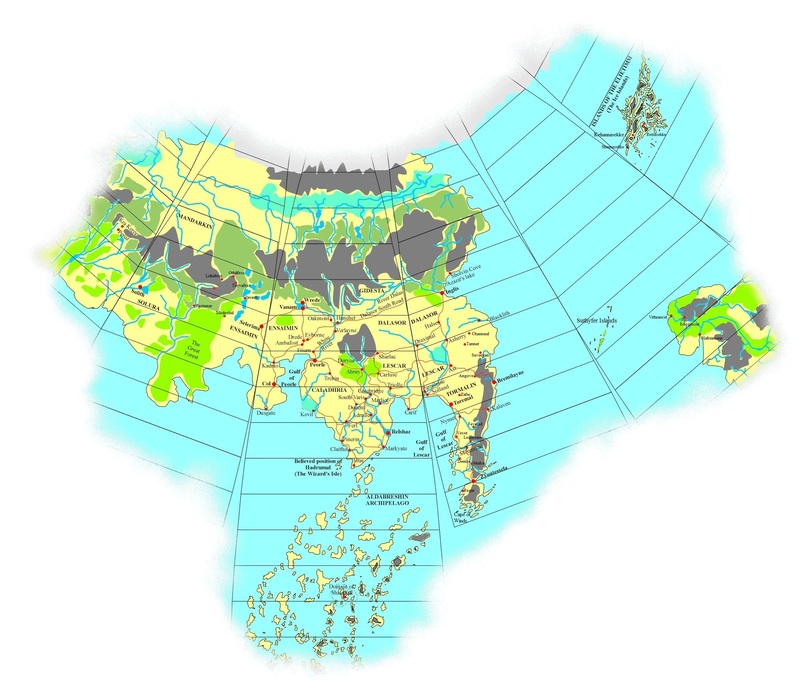 Mapping the Aldabreshin Archipelago and beyond. At least I had a map of the Archipelago to start with. I’d learned my lesson after having to reverse engineer the original Einarinn map from accurately calculated travel details in the text and my (literally) back-of-an-envelope sketch not long before The Thief’s Gamble was published. Okay, my husband had to do the actual work – I was and remain thankful that he’s an engineer whose apprenticeship including training as a draughtsman. Incidentally, he’s the one who insisted the Einarinn maps have projection lines, when I explained I needed a map which I could put a ruler on anywhere to measure distances on the same scale. He naturally felt thoroughly vindicated when we got an enthusiastically appreciative letter from a Geography Ph.D student in Washington State, USA, for whom flat-earth fantasy maps were a personal bug bear. But I digress. As you see from this far more extensive map, I had the upper half of the Archipelago mapped by the end of The Tales of Einarinn, so extending the island groups and chains southward was easy enough. But then I had to decide what lay out to the west. ‘Here be dragons’ might be literally true but I needed to know where and why, and crucially, why they were on the move for the first time in more than living memory. Because ocean and atmospheric currents had changed somehow? That looked like a promising possibility so I went off to do some research, including but by no means limited to buying The National Geographic Atlas of the Oceans and doing detailed searches through my National Geographic Archive CD-Roms. I learned all sorts of useful facts about jet streams, thermohaline circulation, deep cold water flows, tectonic plates and undersea ridges, as well as weather patterns, and what causes trade winds, the doldrums and El Nino. All fascinating and all terms and systems it would be impossible to reference directly in an epic fantasy novel without ruining, well, the atmosphere. This is definitely a situation where the Iceberg Rule of Research applied. Only a tenth of this work shows above the surface, which is to say, appears in the final novel, but that couldn’t be there without the other ninety percent. Now I had the key information which I could add to my map and integrate into the story. More than that, I was now seeing more ways in which wind and sea currents and the distribution of islands would affect travel and alliances within the Archipelago. This work was already influencing the course of the events I had planned for Eastern Tide. It ultimately contributed to The Hadrumal Crisis as well but that’s another story. But all this work stayed on the papers on my desk. 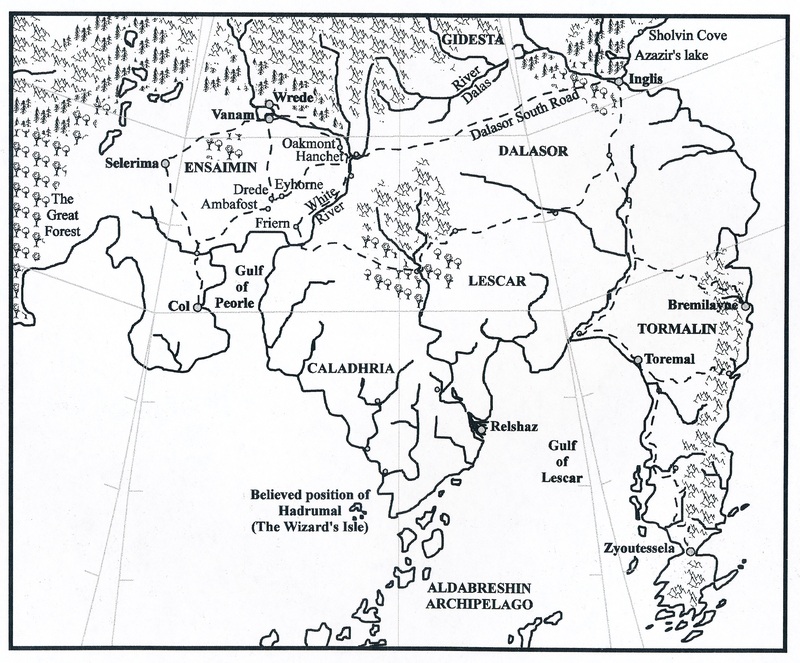 When the Aldabreshin Compass was published in paperback in the UK, we were all forced to agree that the scale and layout of the Archipelago meant reproducing the whole thing at that page size could only offer readers a scatter of uninformative dots. When Tor produced the US hardback, they had more room to work with and included a very handsome map but that could still only offer a section of the Archipelago, unable to show its relationship to the mainland. So only a limited number of fans got to see even that much. And as with the admirable Einarinn maps in the Orbit paperbacks, the copyright for that specific depiction of my original material remains with the publisher, not with me. Well, that was then and this is now. As those who’ve bought Southern Fire and Northern Storm already know, these new ebook editions include a map of the entire Archipelago and now I’m adding it to the website. This time I have my elder son to thank, who took on the not inconsiderable task of cleaning up the digital scan of my master paper copy, with all its creases and pencil scribbles, as well as collating all the other bits of information jotted on sections I’d enlarged and printed off separately to cover with more coloured arrows and notes. Finally he added his own bit of artistic flair, deciding it needed to look like something found in a Hadrumal wizard’s archive, maybe left by some ambitious cloud mage seeing just how far up he could take a scrying spell. I reckoned he’d earned the right to do that.